I wrote once before about how the Department of Rain handles back orders. Only this time instead of a pickup truck, they backed the big truck up the driveway and pulled the DUMP handle. I think we just got May, June, and July all at once. 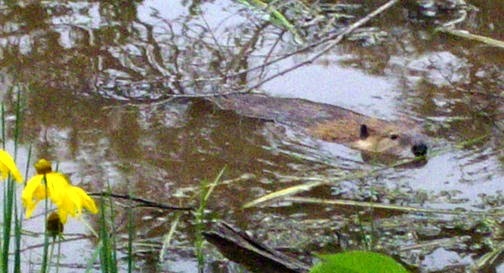 M. and I walked up the creek between storms yesterday and saw the beavers swimming in one of their now-muddy ponds. Outside of those ponds, the creek was almost dry a few days ago. Now it is bank-full. Aside from one stream-side householder upset that beavers do what they do — cut his trees — the neighbors are generally pro-beaver, if only because their ponds must help to charge the shallow aquifer that feeds our wells. Or so we think. It's not like we are hydrologists. The beavers go on modifying the environment to make it better for themselves.